to drawers, doors and throughout the cabinetry. A protective topcoat completes the look. The finish is oven cured for durability. Brown Chateaux colors are shown on this page. 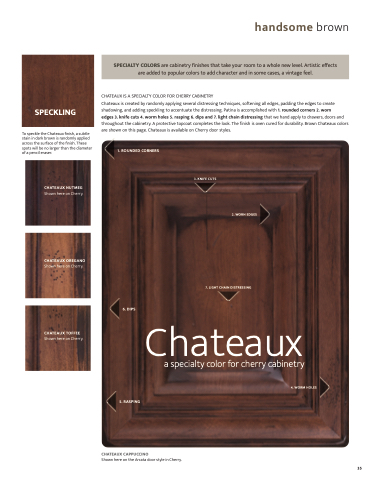 Chateaux is available on Cherry & Rustic Cherry door styles. To speckle the Chateaux  nish, a subtle stain in dark brown is randomly applied across the surface of the  nish. These spots will be no larger than the diameter of a pencil eraser. Shown here on the Reading door style in Cherry. Shown here on the Charleston door style in Cherry. Shown here on the Arcata door style in Cherry. Shown here on the Bainbridge door style in Cherry.